Renders the Earth's Moon; you can adjust phase and colors, and add atmospheric effects. Source: Optional. The clip to be processed. Mode: Popup menu, Default: Luna . Selects how the moon's phase is chosen. You can adjust it directly in Luna mode, or select LunaDate mode to choose a date and time and the effect will use the proper phase for that date. Luna: Select this mode to adjust the moon phase manually. LunaDate: Select this mode to have the effect compute the phase from the given date and time. Center: X & Y, Default: screen upper left. Center point of the moon. This parameter can be adjusted using the Center Widget. Size: Default: 0.3, Range: 0 or greater. Size of the moon. This parameter can be adjusted using the Size Widget. Lunar Phase: Default: 65, Range: any. Phase of the moon, in degrees; 0 is new, 90 is first quarter, 180 is full, and 270 is last quarter. Only available in Luna mode. Year to use when computing the phase. Month: Integer, Default: 3, Range: 1 to 12. Month to use when computing the phase. Day: Integer, Default: 16, Range: 1 to 31. Day to use when computing the phase. Hour to use when computing the phase. Minute to use when computing the phase. GMT offset to use when computing the phase. -5 is Eastern Standard Time, -8 is Pacific Standard Time. Rotation: Default: 30, Range: any. Rotation of the moon image, in degrees. Bumpiness: Default: 0.3, Range: 0 to 1. 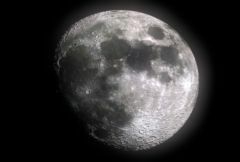 The moon has craters that catch and reflect light. This parameter can be used to adjust how bumpy those craters look. 0 is completely smooth, 1 is very rough. 0.3 is about physically realistic on a clear night. Contrast: Default: 1, Range: 0 to 1. Adjusts the contrast of the moon. Values toward 0 brighten the dark areas. Earth Glow: Default rgb: [0 0 0]. Adds earth-glow, which you often see near sunset when the moon is crescent. The sun's light reflects off the earth, and some of that reflected light illuminates even the dark part of the moon. This gives an especially nice look during a lunar eclipse. Gamma: Default: 1.6, Range: 0.1 or greater. Sets the overall gamma of the moon image. Good for reducing contrast in a different way from the contrast parameter. Sky Color: Default rgb: [0 0 0]. If you want to make a complete sky image with the moon and a colored sky, you can put the moon in a blue sky by setting Sky Color to blue. This will also tint the moon toward the sky color. Adds some glow to the moon. You can see this often in real life when there's some haze or light clouds. Threshold: Default: 0.01, Range: 0 or greater. Threshold for the glow; only parts of the moon brighter than this threshold will glow. Glow Size: Default: 0.75, Range: 0 or greater. Size of the moon glow. Larger creates a more diffuse glow. Halo Brightness: Default: 0, Range: 0 or greater. With certain kinds of high, diffuse clouds, you can sometimes see a subtle rainbow halo around the moon. Increase this parameter to see that halo. Halo Rel Size: Default: 1.5, Range: 0 or greater. Sets the size of the halo, relative to the moon. 1.0 would be the same size as the moon, 2.0 is twice as large. Color Fringing: Default: 0.05, Range: 0 to 1. Increases or decreases the amount of color fringing in the moon halo; fringing separates the colors into a rainbow. Inner Softness: Default: 0.15, Range: 0 or greater. Sets the softness or spread of the inside of the halo, closest to the moon. Outer Softness: Default: 0.3, Range: 0 or greater. Sets the softness or spread of the outside of the halo, farthest from the moon. Halo Saturation: Default: 0.5, Range: 0 or greater. Sets the overall saturation of the moon halo. Increase for a more graphic look. Halo Tint: Default rgb: [1 1 1]. Tints the halo toward this color. Atmosphere Amp: Default: 0.3, Range: 0 or greater. The Atmosphere params add a little noise to the glow and halo, for a more realistic look. Atmosphere Amp controls the amount of atmospheric noise. Atmosphere Freq: Default: 2, Range: 0.1 or greater. Controls the frequency of the atmospheric noise. Atmosphere Turbulence: Default: 0.6, Range: 0 to 1. Controls the turbulence (amount of detail) in the atmospheric noise. Sets the seed of the atmospheric noise. Controls how fast the atmospheric noise changes over time. Combine: Popup menu, Default: Overlay . Combine allows you to combine the moon image with the background in various ways. Moon Only: Ignore the background; show the moon (and its glow and halo) only. Overlay: Overlay (composite) the moon over the background. Add: Add the moon to the background. Screen: Screen the moon with the background. Nice for daytime shots. Max: Where the moon is brighter than the background, show it. This can be useful for daytime shots with clouds. Where the clouds are brighter than the moon, they'll obscure it. Transparent Shadow: Composite only the lit part of the moon over the background, leaving the dark part transparent. This is not physically realistic, since the dark part of the moon obscures the sky and stars behind it, but it can be used for graphic effect. Scales the brightness of the background before combining with the moon. If 0, the result will contain only the moon image over black. If this value is positive, the output Alpha channel will include some opacity from the moon's halo and glow.